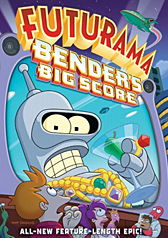 If you go to the special features, hit "more" go down to the "Bender's Big Score and then press right over to highlight the Bender tattoo you'll get a series of scribbles. It is an outline for diffenent shots during the scene where the 3 Frys and Three Benders meet up in the Cryogenics Lab, where the characters would be standing so they wouldn't be seen in as the other characters came into the scene. This Easter Egg was mentioned in the movie commentary.